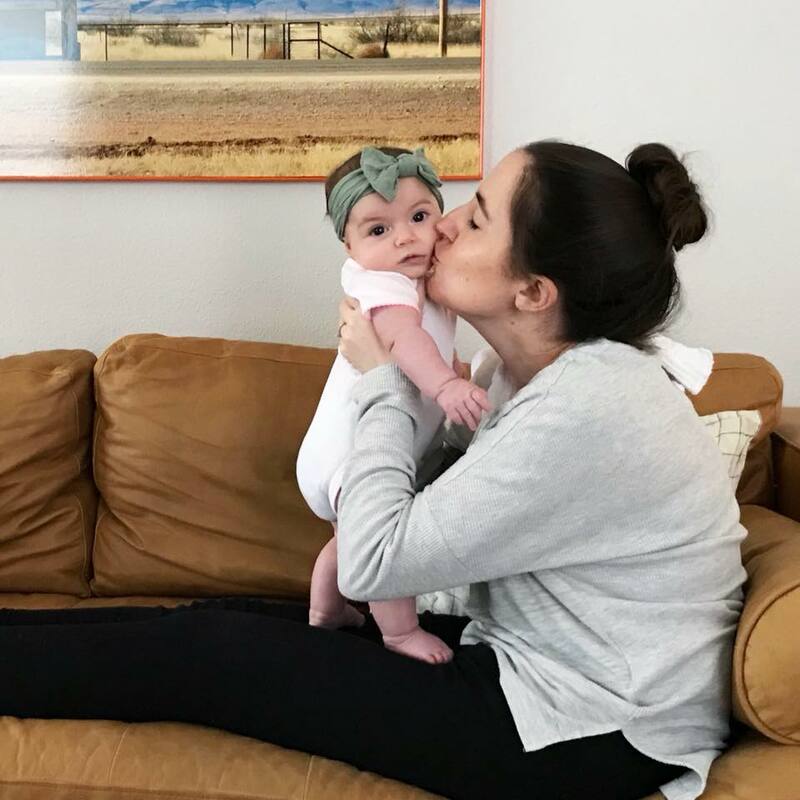 Olivia West | Six Months — K L E P A C & C O . How did we get here? It feels like ages ago that we were bringing our baby girl home. But it also feels like yesterday. Six whole months have gone by and our lives have only gotten better with each passing day. Derek and I were just talking about how we literally love her so much that it physically hurts. I've always heard people say this, but I never truly knew what it meant until we met our Olivia. We just had our six month pediatrician appointment and her doctor was very impressed with her development and she had her first eye exam. He sensed a slight astigmatism so we're going to recheck again at her 9 month visit. With her parents both having pretty bad vision, glasses are probably in her future. She currently weighs in at 16lb 11oz (65th percentile), she is 26.75" long (85th), and her head is 16.75" (75th). Olivia is back to her calm nursing style now that she has gotten through her fifth learning leap. I basically feed her when she wakes up, before every nap, then again around 4:30pm, and then we top her off with a 4oz bottle of pumped milk before bed. She seems pretty content with this method, we don't really have her on a schedule per se it's more of an on demand thing. Once she starts fussing I'll feed her and then put her down for a nap. We started her on solid foods this past weekend with some mashed up avocado mixed with breastmilk. I was so surprised that she knew to open her mouth when I put the spoon close to her face. She loved avocado and didn't spit any back out. She did have some funny faces though and the pediatrician said that is just her gag reflex (think about having peanut butter on the roof of your mouth without knowing how to remove it with your tongue). I went a little purée crazy and made every fruit and veggie for Stage 1 eaters and froze them for future meals. I will dedicate an entire blog post to our feeding style, recipes, etc. She is still nursing regularly, which is her main source of nutrition. Introducing her to solids is really for her to learn about textures and incorporate more iron into her diet, not replace meals just yet. Now that we have an official tummy sleeper this girl has become a solid sleeper. I'm actually very jealous of her sleeping skills. As I mentioned earlier we don't really have her on a set schedule (naps at 9am, 11am, etc.) we let her let us know when she's sleepy and then plan the day from there. For example she typically wakes up at 7:00am on the dot. I then feed her (yay night time weaning.. ouch) then we play in her gym for about an hour or so until she starts grumbling, then I feed her again and put her down for her first morning nap. She will generally sleep for about 1-2 hours and then we'll play and read for an hour or so, feed, nap and we'll repeat this pattern all day until 4:30pm. I don't let her nap past 4:30pm so that it doesn't interfere with her 6:00pm bedtime. I'll nurse one last time at 4:30pm and then we'll play until Derek gets home then bath, jammies, bottle, bed at 6:00pm. Once she is down for the night she won't wake again until 7:00am. I know. 13 hours straight. It's insane. She has been doing this ever since being a tummy sleeper, and also since we switched to overnight diapers (they made a huge difference!) So because there are no longer any night feedings I'll pump around 10:00pm and then go to bed. Which is why we have an insane stash of frozen milk. If her sleep gets thrown off (with errands, doctors appts, etc.) it kind of wrecks with her naps the rest of the day, but she will still go down at 6 for the night, she just may fuss a lot more in the late afternoon. So I try to limit outings that take place during a nap time. Also, her previous white noise app started crashing so we bought this guy and it is incredible. For such a small device it really fills the room with sound. It also has a really nice sort of spa melody that we'll use during feedings if she's getting feisty, which helps calm her down. Olivia still loves her activity center and her baby gym. She loves books holy cow does she love books. I have drained our bank account just buying books for her ha. I plan to do a whole post on the books she enjoys. Now instead of practicing tummy time (because she handles that all on her own whenever she feels like it) we have started practicing sitting. She can alllllllllmost sit up unassisted, she just wobbles a little, but she is SO close. She definitely has the trunk strength because she will almost tip over and then correct herself using just her core, it's really crazy to watch. For her half birthday we bought her this doorway jumper which she absolutely loves. I try and limit her time in the jumper to about 20min because she gets really exhausted and I want to focus more on her sitting up and crawling right now. But its so fun to watch her bounce around. Starting solids was a huge milestone (probably more for us than for her haha). Sleeping through the night is just incredible at her age, I know so many parents still have older babies who aren't sleeping so if you haven't yet check out our method and see if it works for you. She has definitely found her voice and loves to blow raspberries. She will copy our noises and thinks its hilarious. It's hard to make her laugh but when you do it's just the best. She loves to holler at Geoffrey when he walks into the room by yelling "hoooo hoooo" haha. She also doesn't mind her carseat anymore, and loves car rides. She is in a very grabby phase from hair, to earrings, to beards, to her brother's tail, to the doctor's stethoscope. She just has to have it. We call her a bully because she will grab your hair with one hand and your glasses with the other like "give me your lunch money punk" haha. She is still wearing size 3 diapers but has officially moved up to 6-9m clothing. Right now a favorite moment is when she copies the sounds we make. We'll do this fake cough sound and then she'll fake cough, or we'll buzz our lips and she'll buzz her lips, its so funny! She also laughs and laughs when you blow raspberries on her belly. We also love watching her sleep on the baby monitor because she will change positions and directions 100x in a night without making a sound. We'll go in to get her in the morning and wonder how the heck she got into that position. She also really loves beards. If a bearded guy walks into the room he has her full attention haha. Watching her learn and grow right before our eyes has been so incredible.